Facing a group of reporters digging for sensitive details in a crisis or high-profile situation is one of the more terrifying situations a law enforcement or public safety official will encounter in their career. Whether you’re with a large, urban police department or a small County Sheriff’s Department, it’s entirely possible that you’ll face a situation that draws intense news media attention. Anyone in law enforcement or public safety tasked with speaking to the news media should make it a point to attend one of Chris Ryan’s ‘Media Relations for Law Enforcement’ seminars. Attending Chris Ryan’s ‘Media Relations for Law Enforcement’ seminar is a tremendously impactful experience that you soon forget. From the very first hour, you’ll be caught up in activities meant to supercharge your media and public relations expertise. An internationally recognized police media relations and crisis communication expert, Ryan moves like a bullet to the heart of what a leader or spokesperson needs, whether you’re a police official, public information officer, or a corporate media liaison. Mr. Ryan is dedicated to showing every person who attends his ‘Media Relations for Law Enforcement’ seminar what they’re capable of doing under fire. Using innovative live-action techniques, he takes the mystery out of dealing with news media one-on-one or in front of the camera. His extensive crisis response experience allows him to pull back the curtain, revealing tactics used by the news media and reporters especially when following a ‘hot’ news story. He believes in delivering real world information about dealing with reporters and news media, not just theory contained in a cumbersome manual. Mr. Ryan believes every police and public safety leader should know the secret of controlling the narrative, especially under media pressure, rather than being controlled. Ryan’s no-nonsense approach rewards ‘Media Relations for Law Enforcement’ seminar participants with information they can use to ‘hit the ground running’ on the job and in the real world of Police Media Relations. Chris Ryan doesn’t believe in restricting himself, especially in comparison with one-size-fits-all, scripted & canned training programs. It allows him to address the specific needs of each group and individuals that he trains. He works with and connects with his audience and builds the trust necessary to make their learning experience meaningful. His entertaining method of delivery engages participants to astonishing degree. ‘Media Relations for Law Enforcement’ seminar graduates are amazed at the quantity and quality of information they receive and retain the during the course. 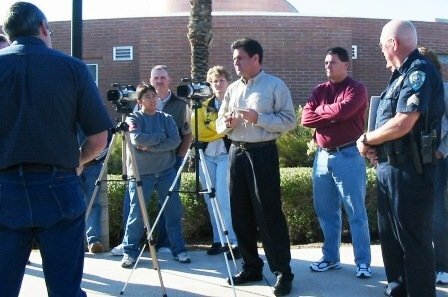 Although the media relations’ training was originally crafted to meet the needs of law enforcement executives and media relations officers, the content has relevance to leaders and spokespersons of any genre. Whether training his audience to handle and succeed in complicated and no-win situations or in honing a succinct message, Chris Ryan recognizes the intense pressure of being a law enforcement or public safety leader, official or information officer. Mr. Ryan is passionate about sharing the most current and tactical information that’s invaluable to those facing the possibility of a news media encounter, press conference or crisis. Becoming a spokesperson who can deal strategically with the news media can be a reality for every person representing his/her agency in a crisis. The goal of attending Chris Ryan’s ‘Media Relations for Law Enforcement’ training seminar is well worth the time and investment. Plan to make this your next training experience. You’ll be amazed at the knowledge and experience that you’ll bring to your agency.